Maybe your PDF file can not be freely copied, printed, modified, etc. when you want to edit it because you have ever secured it with an owner password but now you forget it. Of course, you cannot type the content of PDF document word by word, which is time-waste. 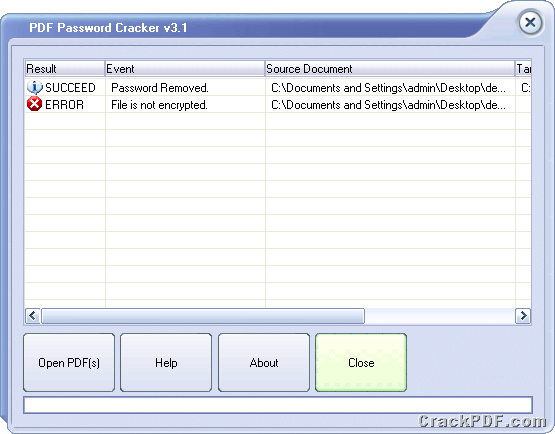 But if you need to use the document urgently, please have a try of CrackPDF PDF Password Cracker which is an instant program to crack PDF password now. The following contents will be the guide to show you how to use this instant program. 1. 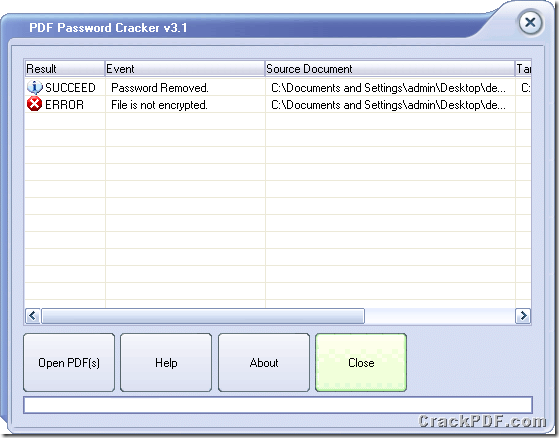 Please download PDF Password Cracker by clicking here and install on your computer. 2. Open the program through Start menu or double clicking its application icon. 3. Add encrypted PDF file into the file list by clicking Open PDF (s) button and choose document from popup window. See it in Figure 1. 4. 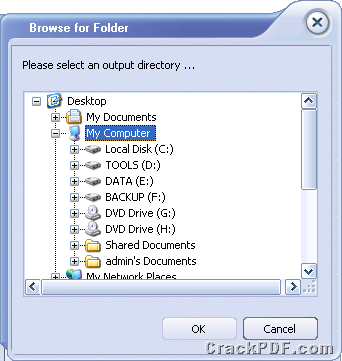 Choose the output location for cracked PDF files in popup window. Please see it in Figure 2. This window is for saving cracked PDF documents in batches. If you remove PDF password for only one file, you will be able to choose location and set the file name for target file in popup window. 5. Click OK button in last step to start to remove PDF password and PDF files encrypted with owner password will be cracked instantly. But the files without any password will show Error information. Please see it in Figure 3. Then in the output location you can open the cracked PDF document and edit it with any kind of PDF editor. 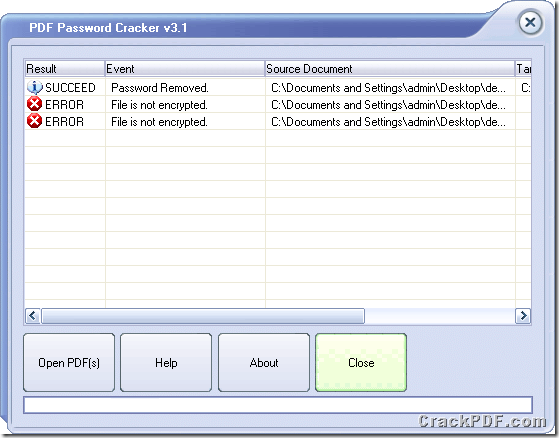 PDF Password Cracker is really a good helper to those who have the right to crack PDF password. If you want to purchase the program, please enter the homepage of the program. Somebody say that he wants to edit a PDF document but he can not copy, print and modify the document and he have no idea what’s wrong. That’s because the PDF document is secured with PDF restrictions and if you have the right to do it, you can crack PDF document with the help of CrackPDF PDF Password Cracker which has the ability to do this kind of work in a second. 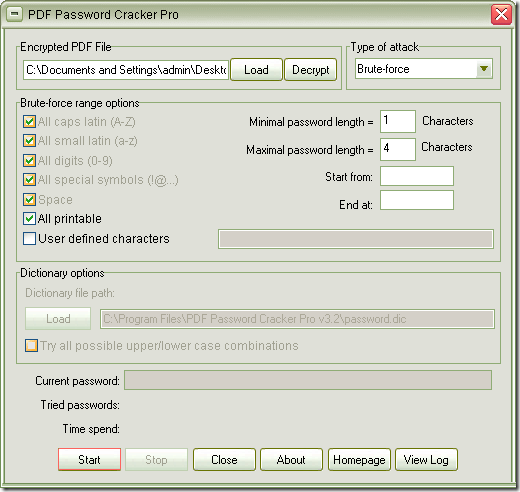 For knowing all features and purchasing PDF Password Cracker, please visit the homepage of it. If you want to download the application, please click here and install it on your computer. By double clicking its icon, you will be able to launch the program and start to crack PDF document at once. Please see the interface of PDF Password Cracker in Figure 1. 1. Click Open PDF (s) button to open file picker window and choose PDF document with restrictions. The application supports to make batch conversion and you can add PDF documents in batches. 2. Choose the output folder for target file (s). Please see it in Figure 2. If you want to see more information about how to use PDF Password Cracker, please click here to see the video tutorial. If you have any other questions, welcome to contact our support team. Where is the best PDF password remover? here! If you want to remove PDF password with a PDF password remover, you can have a try of the PDF password remover introduced in this article—CrackPDF PDF Password Cracker Pro which has the ability to remove PDF user password and owner password. If you want to know how to use this application, please go on reading the following contents. 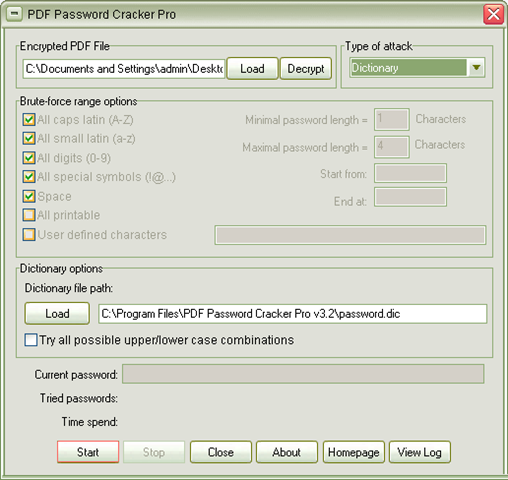 By clicking this link, you can easily download the free trial version of PDF Password Cracker Pro. Just by following the popup setup wizard after you double clicking the installer, you can fulfill the installation process. 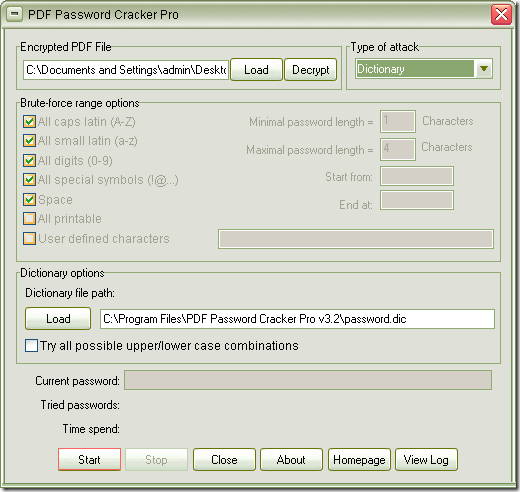 You can open the program via Start menu and the interface of PDF Password Cracker Pro is like the one shown in Figure 1. The most convenient way to add password protected PDF document into this PDF password remover is to drag the file and then drop it into the application. Then you will see its file path show in the box beside the button Load. Then please choose a suitable method to remove PDF password in Type of attack group box which offers three ways: Brute-force, Dictionary and Key search. In Brute-force range options group box, you can specify the PDF password if you know some parts or the length of it for example, you remember the max length of password is 4 and the min length is 3. Then input these parameters and the PDF password remover will help you recover the password for you faster. 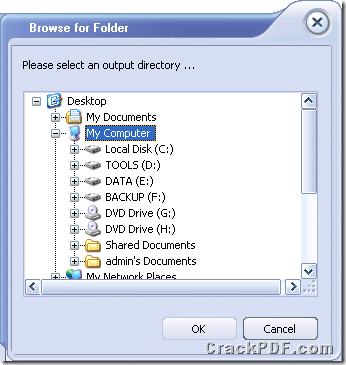 In Dictionary options group box, you can choose the dictionary file on your computer by clicking Load button if you want PDF Password Cracker Pro to remove the password according to dictionary. Click Start or Decrypt button this application will help you start to remove PDF password by trying possible ones. It supports to stop and save the current processing state and you can restart the process any time according to your needs. When the work is done, you just need to save the cracked PDF document in the popup window which is specially for saving target file. If you only want to remove PDF restrictions like copying, printing, modifying, etc., please have a try of PDF Password Cracker. If your former colleague created some critical sales reports and saved as PDF format but he resigned. In this case, you have no choice but to remove PDF restrictions in order to open, read or print these PDF files. Maybe all of us have genuine reasons to unlock or crack a password protected PDF file in the case that you have the legal right to open the encrypted PDF document but forgot the password. But the application used to remove PDF restrictions is an important element which will affect the process accuracy and speed. In this article, you are strongly recommended to use the application with the name of CrackPDF PDF Password Cracker Pro which is an accuracy and efficiency tool. 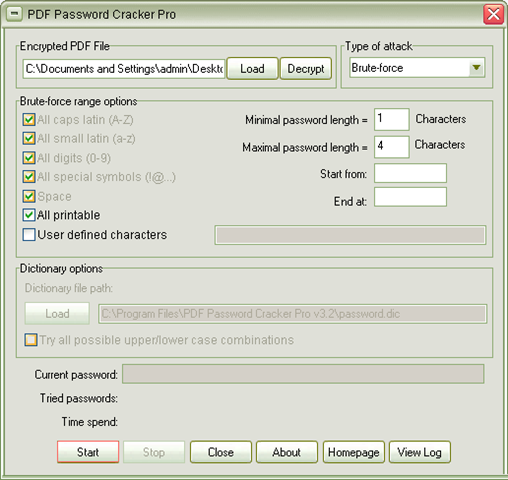 Just download PDF Password Cracker Pro via clicking here and you need to install it on your computer by following the installation wizard. When you open the program, you can see the interface like the one shown in Figure 1. Add PDF document with password (user password/ owner password) into PDF Password Cracker Pro by clicking Load button to open file picker window and choosing the file you need or directly drag the document and drop it into the application. You can also type the file path of the PDF document in the box beside Load button. Choose attacking method to remove PDF restrictions in Type of attack group box which supplies three ways: Brute-force, Dictionary and Key search. Set corresponding parameters in Brute-force range options group box and Dictionary options group box when you choose the removing method as Brute-force and Dictionary. Start to remove PDF restrictions by clicking Start button or Decrypt button. Save PDF document with password as normal PDF document in popup Save as window when the restrictions are removed. Please leave your words here if you have any questions about this program or you can contact our support team online.